Breed Group: Hound Weight: 6-8kgs Height: 30-32 cms Color(s): any recognized hound color Coat: The coat of the Basset Hound should always be short, never long. The coat is dense, hard, and smooth making it weather resistant. Distinct: The long ears of this rather lazy breed are sensitive, which makes him best for a life with older and more respectable children. 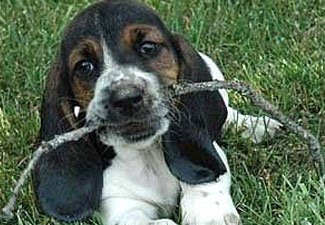 Temperament: Affectionate, lazy, devoted, quiet, and peaceful, the Basset Hound does exceptionally well with a family. This breed loves children, and generally does well with other animals. They can be taught tricks, Activity: Basset Hounds have the tendency to overeat therefore should be given plenty of exercise to keep him healthy. Normally a lazy breed, this dog should be taken on regulated walks and should be allowed a free roam in a safe, fenced in area. Large Dog Breed Bull Mastiff .. English Mastiff ..French Mastiff.. Neopolitan Mastiff ..Great Dane.. St.BernardMedium Dog BreedAustralian Sheperd ..Beauceron..Belgium Shepherd.. Boxer..Chow Chow..Dalmatian..Dobermann.. German Shepherd..Golden Retriever..Grey Hound..Irish Setter..Labrador Retriever.. New foundland..Pointer.. Rajyapalam..Rottweiler.. Rough Coolie..Siberian Husky..SMALL DOG BREED Basset Hound..Beagle.. Bichon Fries..Bull Dog – English ..FrenchBull Terrier.. Chihuahua..Cocker Spaniel..Dachshund..Jack RusselTerrier..Lhasa Apso..Maltese.. Miniature Pinscher.. Pekingese..Pit Bullterrier..Pomeranian..Poodle..Pug..Samoyed..Scottish Terrier..Shih-Tzu..Tibetan Spaniel..Yorkshire Terrier..